Will the Muslim violence against the Indian people, and the contamination of barbaric Islamic ideals blended into their culture, ever end? The Israeli’s and Hindus are the largest victims of perpetural Islamic invasions and violence lasting for more than 1,000 years. Muhammad Ali Jinna, a member of the Indian National Congress and later of the All-India Muslim League (a Khilafat movement that also germinated the Palestine conflict), demanded a two-state partition, creating the Lahore Resolution, which formed the separate creation of Pakistan. This partition of people created a domin effect of other tensions and problems spreading from Khalistan to Bangladesh, to Kashmir, to Balochistan and to continued terrorism and tension existing even today. The British tried to discourage Muhammad Ali Jinna against rallying for the partition and warned against it many times, which ended in riots, mass exodus, clashes and deaths of millions. 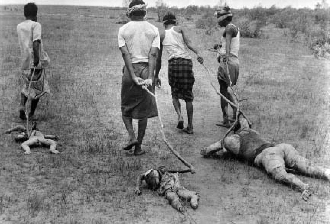 The article covers a poorly exposed incident of Muslim massacres of Hindus that we never hear about. It’s a pity the article forms a common Hindu anti-Western mindset, and fails to acknowledge any attention to the simple fact that Britain saved India from Muslim rule. India would bend to Mecca today had it not been for the clever rulers of South India who formed an alliance with Britain for exclusive trade agreements which developed into British rule and the expulsion of Muslim rule and Sharia law. You never hear Indian people admit to this fact. Instead they are focused purely on anti-Western rhetorics. It’s not Britain who destroyed India. It’s Islam that looted, massacred and destroyed Indian culture from within. 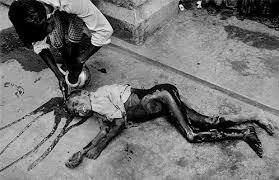 Muslim terrorism, attacks, tensions continue in India to this day. There is nothing surprising about any of this because Islam was introduced into the Asian subcontinent with the objective of occupying and exterminating the Hindus.According to the historian William Durant, and other historians, an estimated 80 million Hindus were killed, were slaughtered, and thousands and thousands of Hindu temples were smashed, and mosques were built on top of them. The Muslims of India tried very hard over the period of their 700 years [of occupation] to wipe out the Hindus. But there was resistance from some of the Hindu kingdoms. They never had full control over India so they were unable to achieve that goal. But that’s the eternal goal. According to Islam, Hinduism is the lowest form of life on the planet. Because Hindus, according to them, they’re polytheistic, they believe in multiple gods. They believe we worship idols, and idol worship is a sin in Islam.